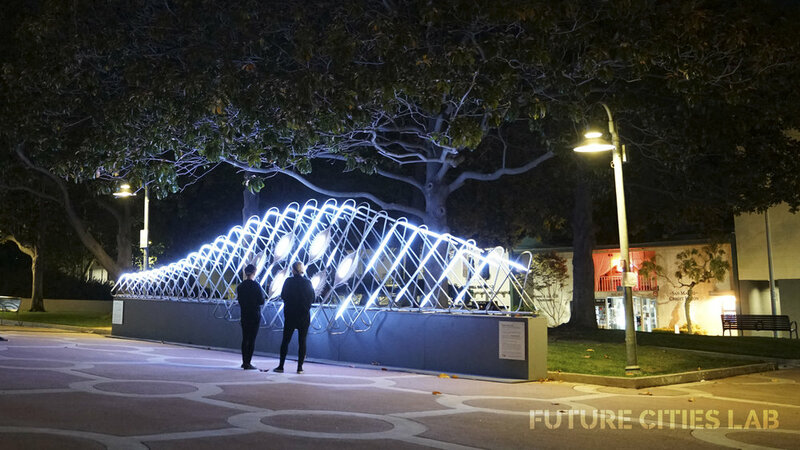 We are incredibly excited to share our proposed "Lightcloud" lighting and art concept with the Oakland community on Thursday, Jan 25, 2018. See the invitation below. Everyone is welcome! In response to community input during approvals of the Jack London 4th & Madison construction project, Carmel Partners hopes to satisfy our Public Art obligation by creating a unique environmental art piece under the I-880 underpass at Madison Street to enhance the pedestrian experience connecting Jack London to Chinatown and Lake Merritt. Carmel Partners conducted a RFP process to a group of artists with past experience working in similar environments and with similar public agencies, and selected Future Cities Lab for their experience, Oakland connections, and most importantly their awesome concept. An image of the initial concept is attached. We would like to get neighbor and community input on the art concept and so will host a public community meeting for neighbors and the Oakland community to learn more and provide comments and suggestions to the artist team. Please join us if you can. We are excited to be included in this amazing guide to interventions in the public realm. Active Public Space is an initiative led by IAAC, that argues that "Public space can now be transformed into Active Public Space, fostering people interaction with flows of energy, materials, services and finances to catalyse sustainable economic development, resilience, and high quality of life." Murmur Wall and Datagrove are both included in the publication and exhibition with an great group of other architects, artists and designers. Nataly presented our work at the symposium in Barcelona on November 13th and 14th, 2017. Nataly, Jason and the team at Future Cities Lab are thrilled to announce that Joel Frank has accepted the position of, "Prototyping and Fabrication Manager". After working with us for close to a year, Joel will now officially manage our prototyping and fabrication shop and staff in San Francisco. Joel is an accomplished artist in his own right and brings an impressive range of experiences to our growing team of designers and fabricators. FCL: What are your past experiences working as a fabricator? JF: Growing up on a vineyard in Oregon I was always in and out of wood shops building the doodads and patches for the farm. Through undergrad and graduate school, the tinkering extended to metal shops, print shops, painting studios, and anywhere creative stuff was going on. It turns out, creative stuff is going on all over so for many years I traveled working from place to place: in Norway as an artist’s assistant, in Umbria teaching fresco painting, in Japan at a furniture factory. I worked on Griffin printing presses at a non-profit studio in Portland, and taught painting and design at UC Santa Cruz then recently ceramics at Mills College in Oakland. Over the last few years, my interests have expanded to processes of making that include technology driven methods of fabrication and computer assisted design so I’m happy to be entering the the era of robot arms and omniscient tools with Future Cities Lab. FCL: Is there a particular artwork - from any period - that you admire most? Why? JF: Well, I don’t know if I would call it my favorite or would be able to single one out but I was recently very moved by James Turrell’s piece in Naoshima, Japan. It’s the opposite of tech-forward and really isn’t anything but light and atmosphere but for that reason, as a builder, I find it important to stay rooted in the fundamentals. Light shapes everything from the initial design concept to the physicality of a final object. So rudimentary considerations of light are fascinating to me. At Turrell's piece, you are led into a building that starts with switchback walls so no light reaches the inner room; you can’t see your hand in front of your it’s so dark. As you stumble in, you’re then asked to feel your way to benches and sit. For 20 minutes or you sit there in complete silence and in complete darkness. Eventually over that span of time, the lights in the room slowly brighten to a purple glow and the contours of the room become visible until by the end you can plainly see the space and people around you. Then the docent that led you into the room appears and tells you that the lights have not changed since you entered the room. “Your eye’s have merely adjusted, you may stand up and freely exit the room”. I found this so impressive because the piece did nothing, it was just the creation of an environment where you got to do so much. In that darkness, you could actively gauge a shift in your own perception. It felt like Turrell was trying to say if you change the way see, you can freely get up and walk out of a place that you stumbled into with such difficulty before. FCL: What are your favorite techniques or materials to work with? JF: Right now working on Lightweave at FCL has me deep into metal bending and the naked beauty of welding. So as cliche as it is for welders to be all about the “bead”, I have to say, I’m pretty into that rainbow bead of a nice stainless steel weld. In my own work I am a painter turned large-scale ceramicist so I love the versatility of color and texture there but I’m starting to merge that with metal. Combining the cold calculation of steel with the colorful organicism and tactility of ceramics is like putting high drama debate of our age, artificiality meeting humanity. I’m into that. FCL: Tell us about your own art practice? JF: As I mentioned, my practice is centered around ceramics. I am interested in taking the medium which is typically relegated to quaint cups and bowls to a large, architectural scale. I’m trying to push the concept of modularity so I can make the work breath, expand and contract based on the space around it. The ceramic components are generally paired with metal armatures that form the basis for a narrative that speaks to synthetic spaces and objects meeting the more whimsical organic ceramic forms. You can follow Joel's personal Instagram account here! We had fun hacking Murmur Wall right before it was de-installed in Palo Alto a couple of weeks ago! Enjoy some of our custom animations that were sent to the artwork using TouchDesigner. 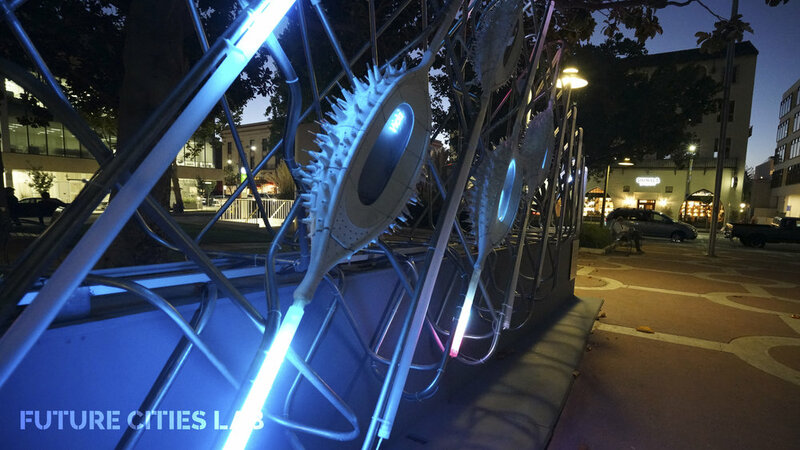 04/11/2017: Future Cities Lab is excited to announce that the Murmur Wall will be featured in Palo Alto’s Code: ART festival, June 1-3, 2017, sponsored by the National Endowment for the Arts and the Palo Alto Public Art Commission. It will be on display in front of Palo Alto's city hall for four months, from June through September 2017. The Murmur Wall is an artificially intelligent, anticipatory architecture that reveals what the city is whispering, thinking, and feeling. Sharing local activity, trending topics, and whispers, the Murmur Wall will allow the people of the city to share and reflect on real-time activity. Code: ART’s goal is to reframe Palo Alto as a “laboratory for urban interventions and creative placemaking.” In order to engage and encourage interaction within the Palo Alto community, the festival will feature eight urban interventions that will activate the current downtown corridor. It should be an exciting event! Future Cities Lab was excited to be included in the Ambiguous Territory Exhibition that just wrapped up at the University of Michigan Taubman College of Architecture + Urban Planning. Our model for the Theater of Lost Species was exhibited among an great group of other designers. Check out the video below. The exhibition will be moving on to New York to the Pratt Manhattan Gallery in 2018, so stay tuned! 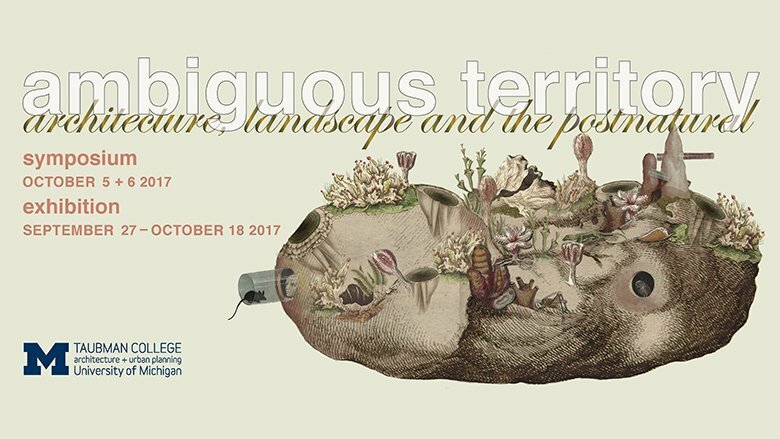 From the website: "Ambiguous Territory: Architecture, Landscape, and the Postnatural is a symposium and concurrent exhibition that situates contemporary discourses and practices of architecture and landscape within the context of the Postnatural; the era of climate change, the Anthropocene, and altered ecologies. The project asks: In a time when humans have been fundamentally displaced from their presumed place of privilege, philosophically as well as experientially, should the disciplines of architecture and landscape architecture consider displacing themselves as well, in order to establish new affiliations and avail new ways to approach contemporary questions of design in relation to the environment?" Nataly will be speaking in the Responsive Cities: Active Spaces symposium at the Institute of Advanced Architecture of Catalonia (IAAC) on November 13th. Great group of speakers lined up! From the website: "Technology is emerging as a powerful generator of new digital public spheres, producing a strong impact on the physical shape of the city itself. As new tools and planning strategies rise, designers and urbanists face new challenges. Which are the new functions and configurations that emerge in the Public Space? How do citizens interact with the urban elements and how do those latter perform? The public space is the catalyst for urban renewal in the core of cities. It is the place where participatory local democracy occurs, where the character of a Society is materialized and where all infrastructure networks that connect the City functional nodes come together ... The Responsive Cities 2017 Call focuses on the applications and implications of new technologies in the dynamic sphere of public spaces. The specific focus is placed on the advancements of technologies of information, interaction and fabrication in the redefinition of public space, as catalyst for achieving urban resilience and high quality of life." 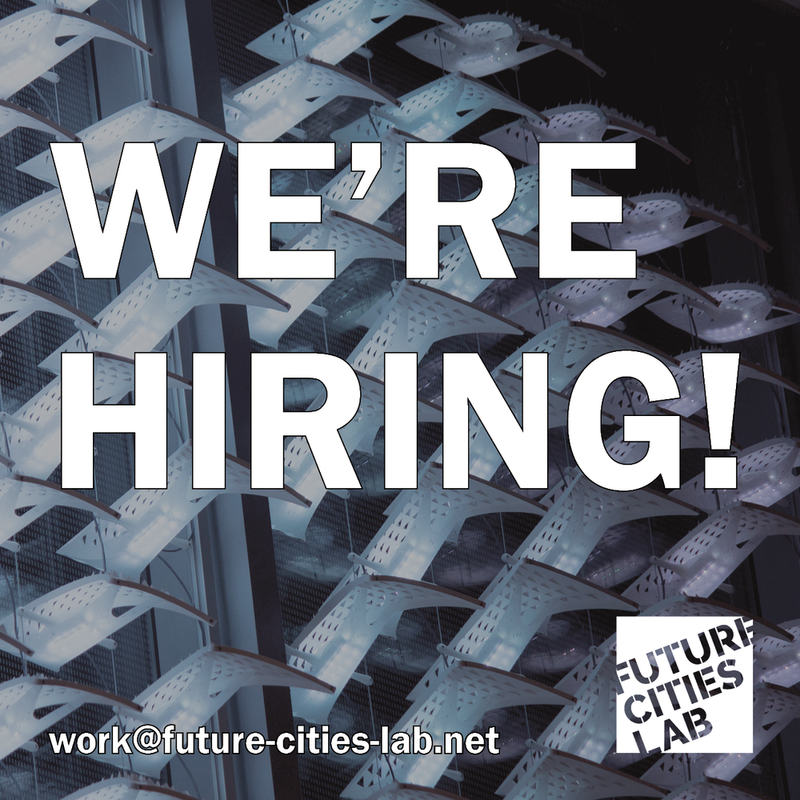 FUTURE CITIES LAB is hiring! Our San Francisco based studio is looking for a few amazing people to join our growing team. We are looking to hire an inspired Fabricator / Designer who can contribute to projects at multiple scales from concept design, prototyping, fabrication and installation. You will be working alongside a team of talented and dynamic people involved in the Bay Area arts, architecture, tech and fabrication communities. We are looking to hire an individual who can design and manage art and architecture projects at multiple scales from concept design, prototyping, fabrication and installation. You will be working alongside a team of talented and dynamic people involved in the Bay Area arts, architecture, tech and fabrication communities. We are looking for an organized, professional and inspired person to help us manage our San Francisco studio, and communicate with current and future clients. You will be working alongside a team of talented and dynamic people involved in the Bay Area arts, architecture, tech and fabrication communities. If interested, please send us an e-mail (work@future-cities-lab.net) with any questions, and send a PDF or link to resume and portfolio. Please outline specific skill sets and interests. Thanks! Nataly Gattegno will be lecturing at the Gerald D.Hines College of Architecture and Design at the University of Houston on September 19th. Nataly will be presenting recent FCL projects as well as some projects on our computer screens and shop tables! Nataly Gattegno will be a guest speaker at the NXT City Future: Proof symposium in Toronto, Canada in October. Nataly will present recent FCL work that explores the possible opportunities for public space when it intersects with digital technology, advanced fabrication techniques, networked performance and craft. From the website: Public Space on a Global Stage. From cutting edge civic innovation to disruptive ideas that challenge red tape, meet the top players pushing the limits of public space around the world. Future: Proof will spark ideas about how we perceive our public realm, emphasize the critical impact it plays today and challenge us to consider how best to shape it for the future. Nataly Gattegno discusses the work of Future Cities Lab with Michael Copeland for Dell Technologies Change Agents on Forbes Magazine: from ancient Greece to the Murmur Wall and contemporary public space. Listen to the full podcast here. From the website: What will the cities of the future look like? Autonomous cars, interactive walls, and sustainable infrastructure are just a few of the ideas being looked at by city planners around the world. In this episode of The Current podcast, Michael Copeland speaks with Nataly Gattegno, co-founder of the Future Cities Lab to find out how cities will evolve. Future Cities Lab is excited to participate in the 2017 Seoul Biennale of Architecture and Urbanism "Imminent Commons" curated by HYUNGMIN PAI & ALEJANDRO ZAERA-POLO. Our "Chronosphere" interactive installation will be presented in the "Sensing Commons" pavilion. The opening is Sept 1-2, 2017. From the website: Chronosphere is an immersive theater for seeing, hearing and interacting with the complex flows of data being captured by the network of urban sensors throughout our cities. 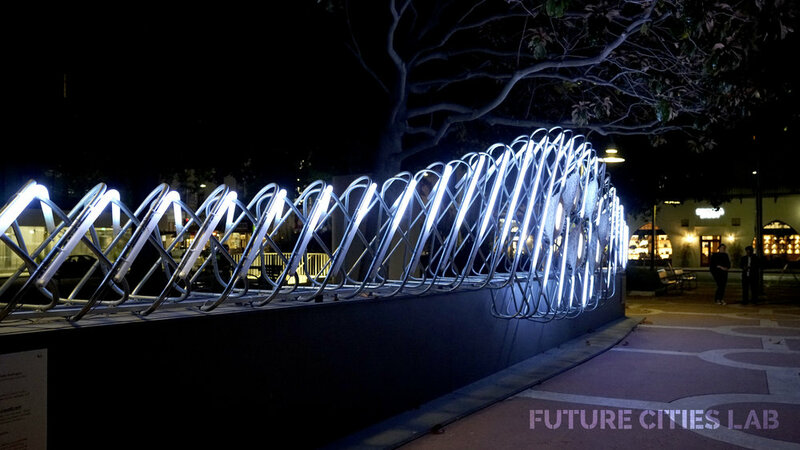 The cloud-like installation is composed of suspended illuminated planes that serve as portals into this digital world of flowing points, lines and variable forces. The Chronoscopes installation’s floating planes will act as portals to reveal the dynamic urban data that flows around us. These virtual portals blend the digital realm with the physical one, creating a system that expands the limits of urban public space. Reading in API sensor data from the surrounding city through Seoul’s open data system, Chronosphere will offer a real-time peek into the live and evolving sensor data of the city. As data networks are formless and spaceless, what happens when they are overlaid on the thousand-year-old urban network? How can we begin to thread this sensor data back into the flows of the city? 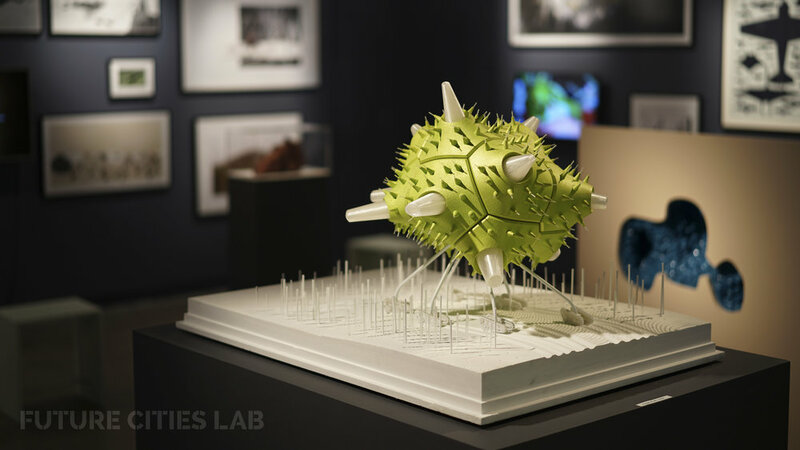 Future Cities Lab is excited to exhibit work at the Museum of Craft and Design in San Francisco, as part of the show Architectural Pavilions: Experiments and Artifacts, curated by Mariah Nielson. We have included models and prototypes from three projects that span the timeline of our recent work: Trilux, Thermaesphers and Anemone. The show is open from 6/24/17 - 1/7/18. From the website: This exhibition presents digital and handmade architectural pavilions by Bay Area, national and international architects. The work included in Architectural Pavilions: Experiments and Artifacts will transform the galleries of the Museum of Craft and Design into an immersive architectural environment, demonstrating a range of projects from small-scale models to full-scale installations. 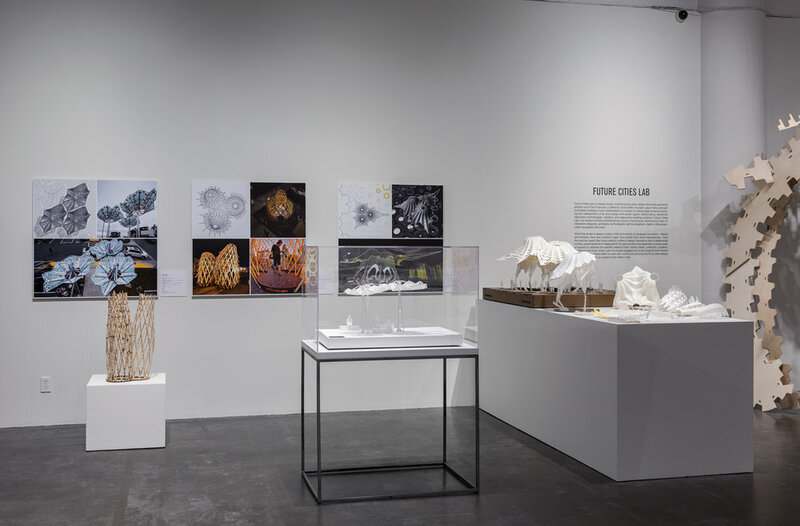 The content included in the exhibition is diverse – material samples, drawings, films, models, mock-ups, and full-scale installations reflect the broad range of techniques that architects employ to build pavilions at variant scales. This exhibition addresses architecture’s physical and collaborative processes through the presentation of digital and handmade pavilions by eight architectural studios: Carmody Groarke (London); DOSU Studio Architecture (Los Angeles); Future Cities Lab (San Francisco); Jay Nelson (San Francisco); Materials & Applications (Los Angeles); SITU Studio (New York); UC Berkeley Architecture students, Prof. Lisa Iwamoto (Bay Area) and Warren Techentin Architecture (Los Angeles). FCL Presenting Lightweave in VR for WIRED and SKYY Vodka 25th Anniversary Event Make. Every Day Future Proof. 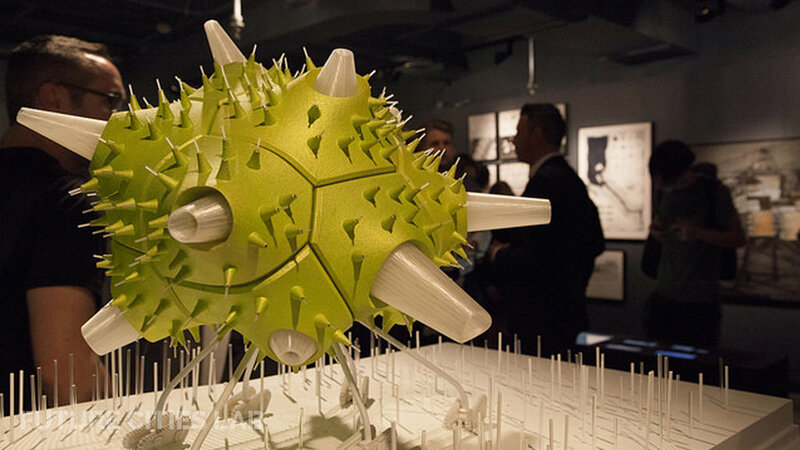 Future Cities Lab will be featured at the SKYY Vodka x WIRED Make. Every Day Future Proof. Launch Event on April 25, 2017 at The Pearl, in our Dogpatch neighborhood of San Francisco. In celebration of the 25th anniversary of SKYY and WIRED, the event will feature designers, creators and makers from all over the Bay Area, each showcasing projects that accelerates toward the future. 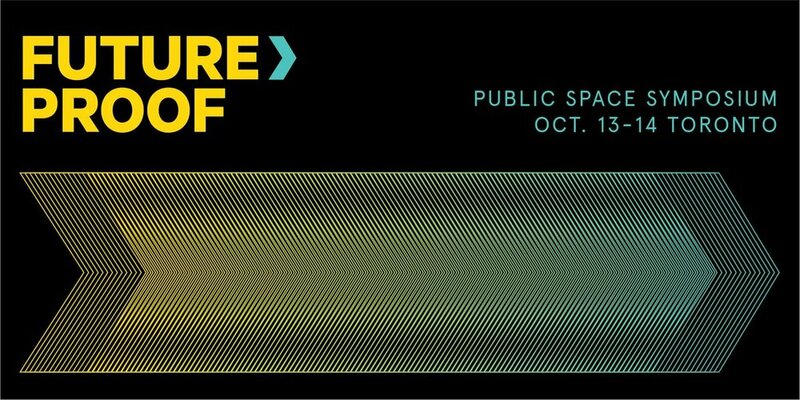 Future Cities Lab will be presenting Lightweave, our upcoming interactive public artwork in Washington D.C.'s NOMA district. Event attendees will be able to walk through Lightweave in virtual reality through an Oculus Rift, experiencing the artwork's interactive light and spatial effects. Future Cities Lab Co-Founder and Managing Design Partner Nataly Gattegno will be lecturing at the College of Architecture and Environmental Design at the University of Tennessee, Knoxville. The lecture is a part of the Robert B. Church Lecture Series and will be on Monday, April 10 at 5:30 p.m. in the Art + Architecture Building’s McCarty Auditorium. The event is free and open to the public. 3/7/2017 Update: Today the San Jose City Council voted unanimously to move forward with our San Jose Levitt Pavilion competition entry!! The San Jose Mercury News article is here. 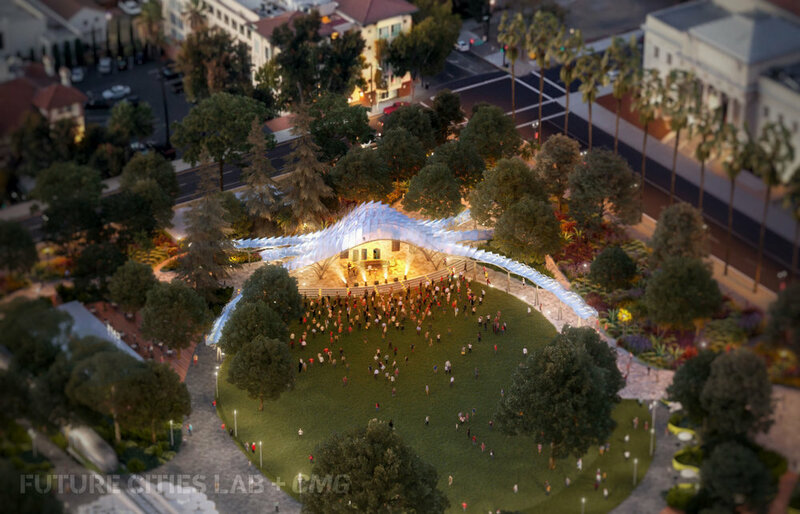 Phase 1 of the estimated $41 million dollar project will prioritize the Levitt Pavilion proposal designed by Future Cities Lab, and landscape design by CMG Landscape Architects including new amenities like a large playground, redesigned fountain, dog park and integrated picnic area. The design also moves the light rail station now in the park south of St. John Street and closes North Second Street to car traffic. Future Cities Lab is proud to announce that we will be featured in Luminary on Saturday, March 18, 2017 at the Midway Gallery in San Francisco, California. Our projects will be presented alongside the works of five design professionals in “Building, the Future,” a photography exhibit by Britelite Immersive. The event was recently featured in an article in Architect Magazine, which quotes Clark Suprynowicz, artistic director of Future Fires. He explains, "there’s an evolving capacity for surfaces, areas, environments to be responsive to the people in those [spaces]" and expresses excitement for “the way the barrier between 'audience' and 'art,' or 'observer' and 'participant' is becoming more porous." Luminary is an art, music, and technology festival hosted by Future Fires, a platform that promotes artists of all kinds. The event will feature artists, musicians, designers, and architects from all over the world in part of this interdisciplinary collaboration. It is a celebration of the San Francisco art community and its ongoing evolution with the emergence of technology. 2016 STUDIO WRAP UP & HAPPY NEW YEAR! 2016 Wrap Up and Happy New Year 2016-17!